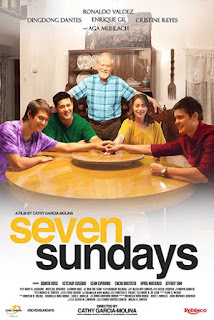 A family drama, Seven Sundays, starring Aga Muhlach, Dingdong Dantes, Enrique Gil, Kristen Reyes and Ronaldo Valdez. Directed by Cathy Garcia - Molina under Star Cinema Production. Released last October 11, 2017. A family relatable film, where the story revolves around the Bonifacio siblings as they found out that their father Manuel Bonifacio (Ronaldo Valdez) has cancer and had seven weeks left before he dies. So, he requested his children, Allan (Aga Muhlach), Bryan (Dingdong Dantes), Dec (Enrique Gil) and Change (Kristen Reyes) to spend time with him every Sunday. The siblings reunites and little by little resolves their old sibling issues before their father dies. A heart touching movie for family. It portrays the Filipino family values and how family ties come together in times when a family member is in need of help. The plot is predictable but the lesson we can get from the movie is well defined. A tear jerking and a must watch film.